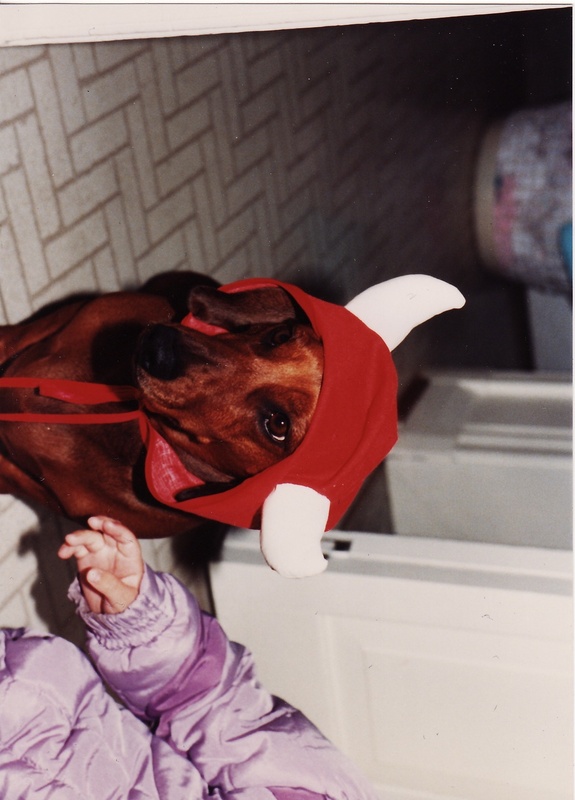 I grew up with dogs. 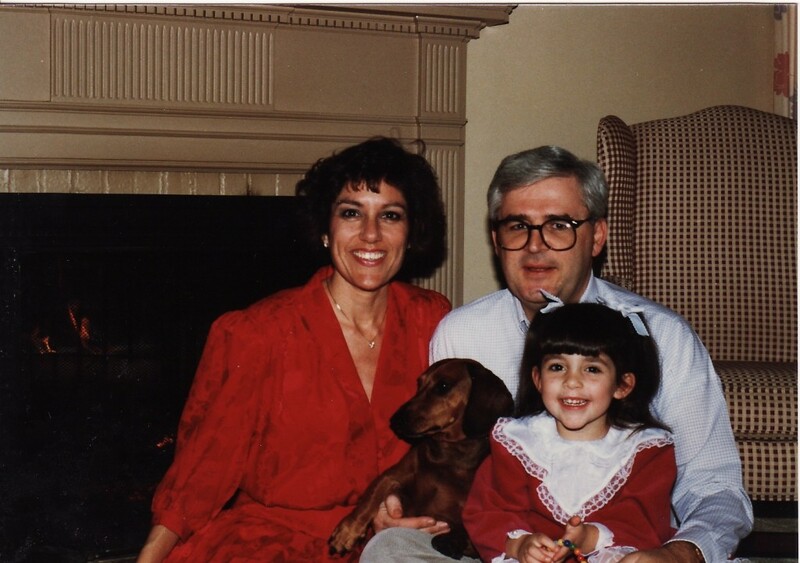 In fact, from before the time I was born to now, my parents have never not had a dog. And every single one of our dogs was bad — loveably bad — in its own way, to the point where I’m pretty much ruined for good dogs. I need my dogs to be just a *little* mischievous. 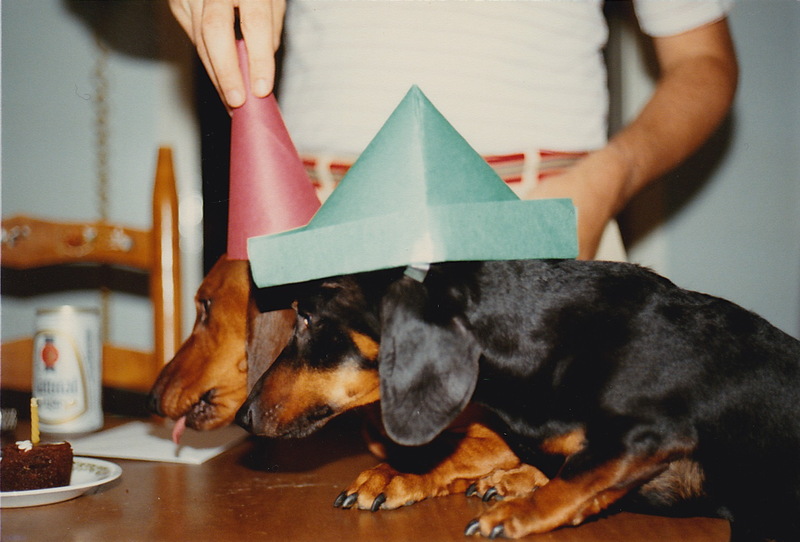 My parents’ history with bad dogs started — before I was born — with the infamous Fritzi, a black-and-tan dachshund that someone at my mom’s work was trying to give away. 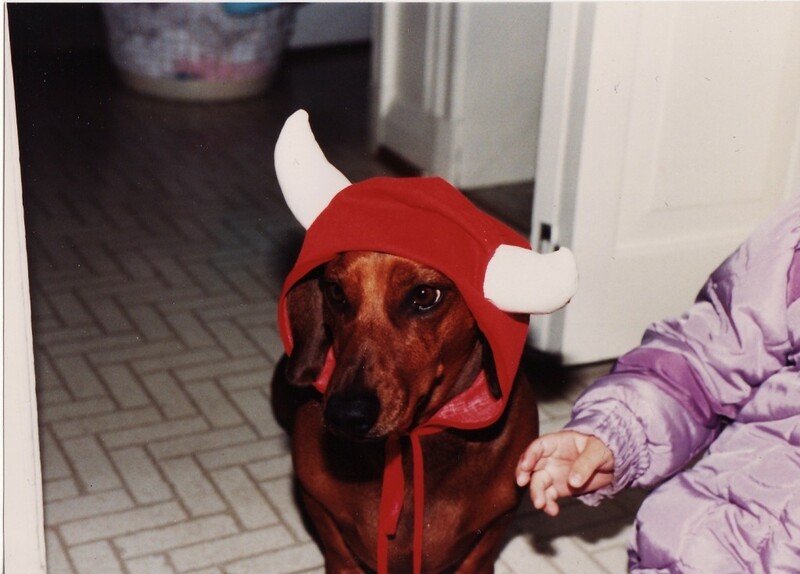 Although this should have been a red flag (“take this dog, please”), my parents took no notice. Nor did they heed any of the other warning signs that Fritzi may not have been the best choice for a family pet, including the fact that he came from a decidedly rough background (he was a stray dachshund on the streets of downtown Baltimore for Pete’s sake) and, inexplicably, he only ate steak. Nonetheless, my parents adopted him. 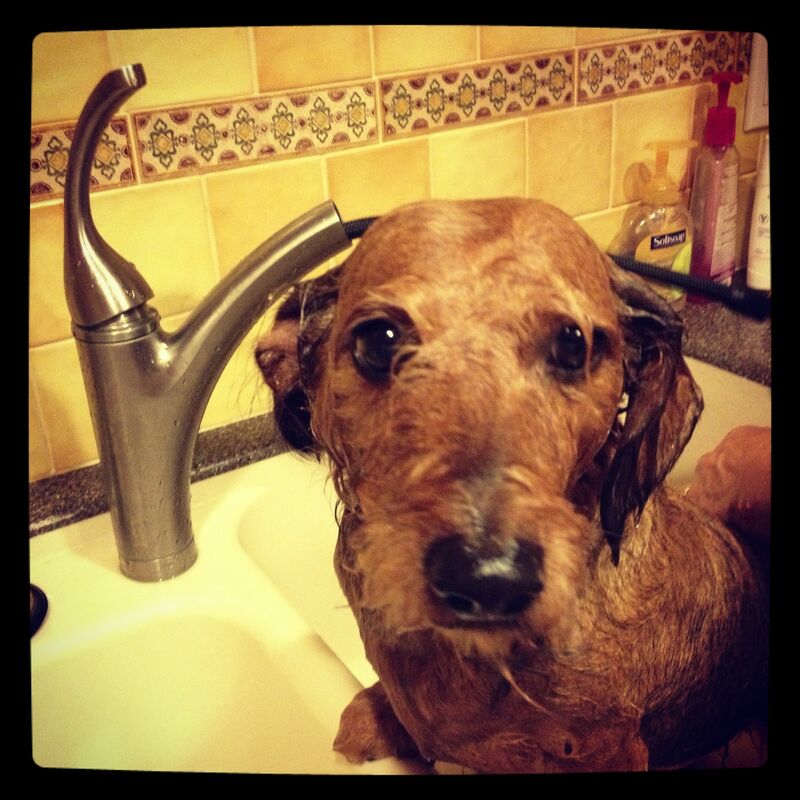 Soon after, they also took on another bad dog, Max, a thirty pound behemoth of a dachshund. Max and Fritzi became fast, misbehaved friends. Although Max was severely naughty in a number of creative ways (he would jump into strangers’ cars, he ran away frequently, he ate garbage – both ours and our neighbors’–, he enjoyed rolling in poop and worms, he got stung in the mouth by a bee because he was trying to eat it, he ate an entire wicker dog bed, etc., etc. ), he wasn’t actively malevolent. 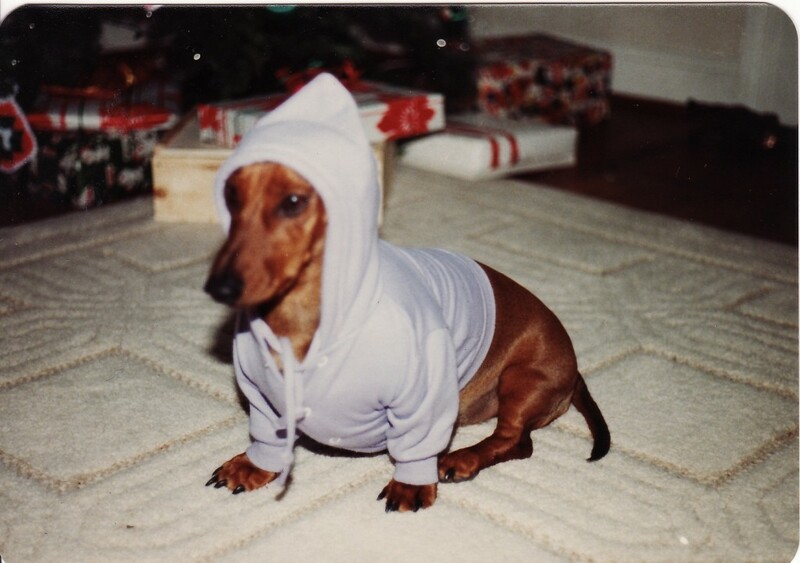 Fritzi, on the other hand, was bad to the bone. He bit people (including the poor, hapless mailman) and attacked animals. One terrible day, when my mother was eight months’ pregnant with yours truly, she and my dad took Max and Fritzi to a friend’s farm. While Max happily rolled around in cow manure, Fritzi set about biting a horse on the nose (he had to jump up in order to accomplish this) and mauling a duck. 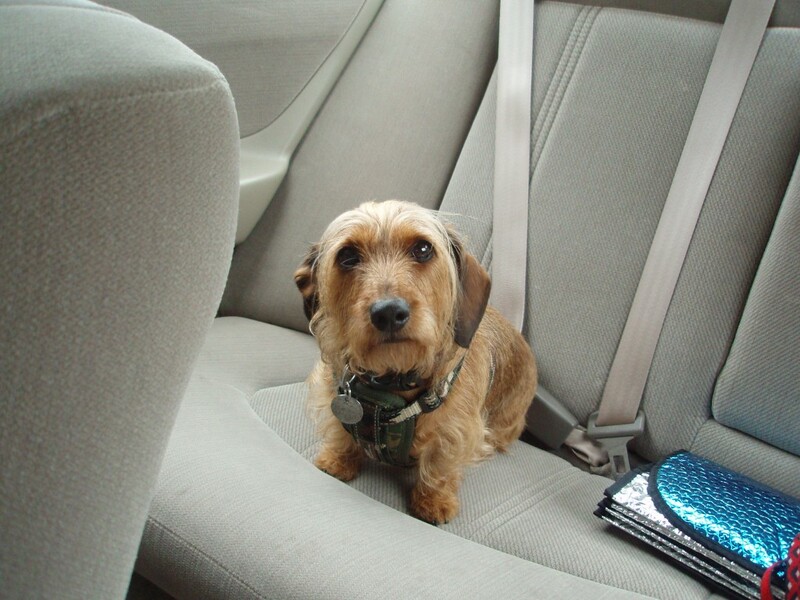 When my parents got the dogs back into the car at the end of the day, Max was happy and covered in poop, while Fritzi had an evil gleam in his eye and blood and feathers stuck to his mouth. My mom realized Fritzi had to go. So, with a heavy heart, they gave him away and hung onto Max, my older brother. It worked out well. For a long time, we were a family of four: Margie, Tom, Max, and Stephanie. In that order. Then, when I was in second grade, we adopted Towser, my baby. 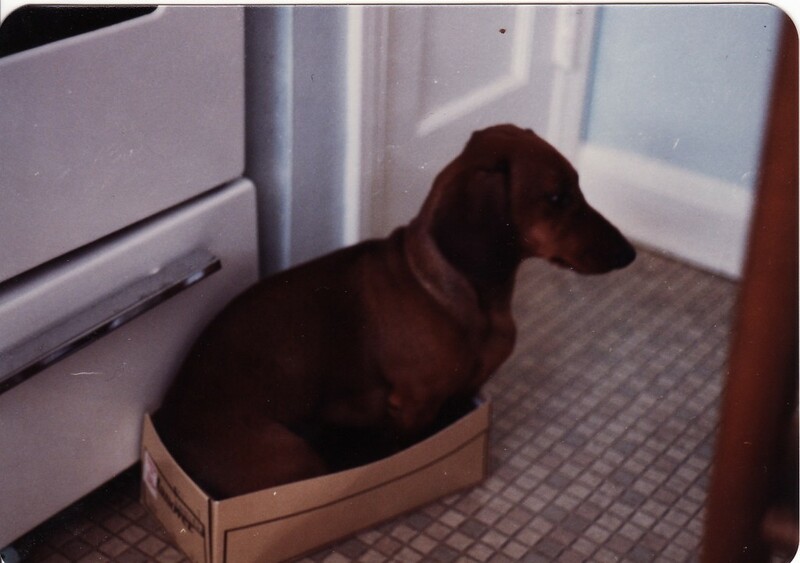 Towser Ivy Early was an exception to the bad dachshund rule: she was sweet, loved everyone, and only occasionally ate rotting garbage. She did, however, pee everywhere whenever she got excited (this happened often), despite our best efforts to train her. 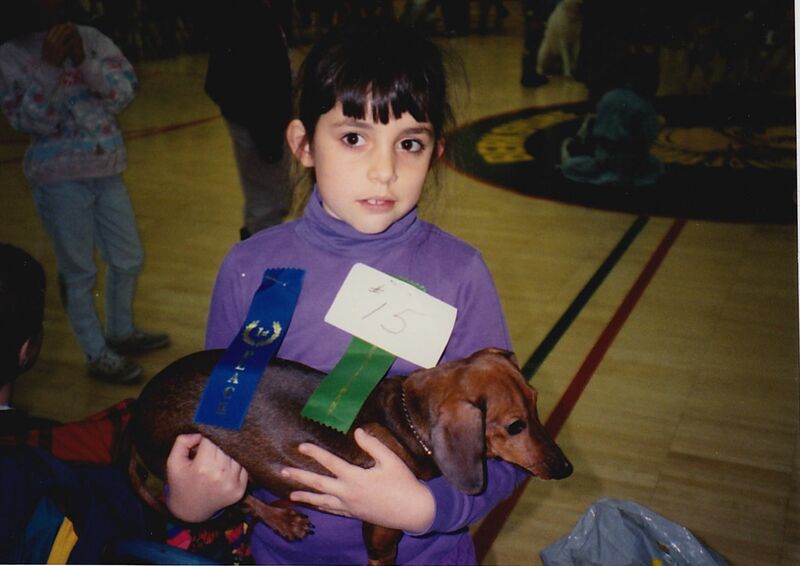 She did win “Smallest Dog” in our local kids’ dog show, though, so her life was not without distinction. Max died at the ripe old age of 17 and was bad until the end. Towser went to the Great Doggie Beyond when I was studying abroad (and it still hurts to think about it). 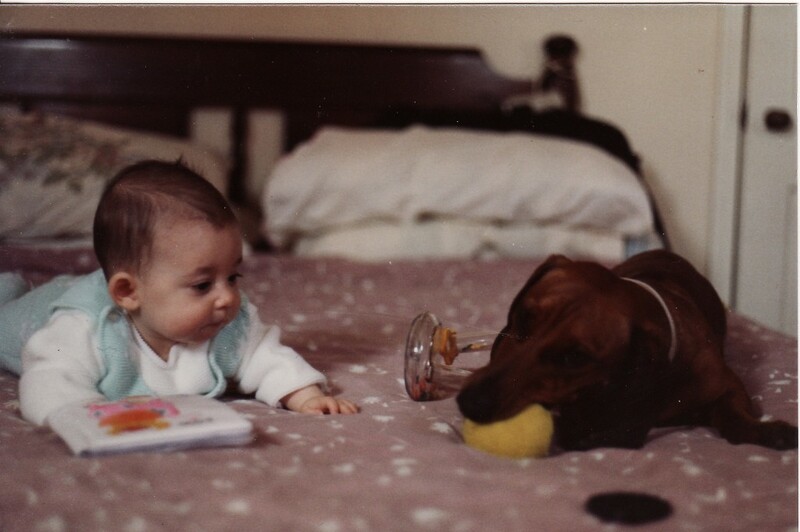 For a little while, there was a lonely gap in our lives when we didn’t have a dog. Then, we got Dougal. Oh, Dougal. What to say about Dougal? But he’s not bad. Not really. Not compared to dogs of our past. We love him anyway. My husband and I share a predilection for bad dogs. When Al was growing up, he had a dog named Midnight that was half-Pointer, half-black Lab, and was exceedingly naughty. My favorite Midnight story (and I’ve heard a lot of them) is when he distracted the entire family by barking crazily at the front door until everyone got up to see what was going on, and while everyone was at the front door, he ran back into the dining room and ate the food off the table. Pretty genius, no? Anyway, a little bit of badness in a dog can be a good thing. Max introduced us to some of our best family friends in Baltimore because he ran away and a family, the Erpensteins, found him and called the number on his collar. We’re still friends with them today, over twenty years later. We never would have met them if it weren’t for that naughty dog. So, whenever Al and I get a dog, we’ll be in the market for a dog with a lot of personality — and a little dose of badness, for good measure. This entry was posted in Life and tagged Dachshunds, dogs, family on December 8, 2012 by Stephanie. He was a frequent visitor to our house in Williamsport when your Mother and Father were living with your Grandparents on High St. Scottie and Vicki loved that dog, me on other hand tolerated his visits. I have a picture of him and Vicki in my conglomeration of pictures (I will organize them one day). On one happy visit with Max I was scurring around the house (that damn dog was alway under foot) then all of a sudden I found myself on the floor. I don’t remember the goury details (ask your Mother). I wasn’t too happy with Max. In the end we had a good laugh. If it weren’t for good old Max, we would have never become friends. My girls would babysit for you, and I don’t remember which one went to take care of you and when she came back to finish her meal, Max had beat her to it. He was a good old dog. Love reading your blog. That video on Youtube is soooo hilarious 🙂 Amazing, characterful dogs you’ve had!